On the surface, at first glance, there may not seem like much of a difference between otters and beavers. Yet they are vastly different animals, and even come from different orders. The otter is a member of the order Carnivora. The beaver is a member of the order Rodentia. This is based on some physical differences, but also highlights a main difference in their lifestyle. The otter is a carnivore, while the dam-building beaver is a rodent, and prefers the vegetarian lifestyle. The otter is a relative of the weasel. The beaver is a relative of the rat. While they maintain very similar characteristics, their overall origin differences create different types of behaviors, and different characteristics of study. The physical appearance of each is also a bit different. The beaver is somewhat squat, built in a shorter and stockier manner, as a husky little guy. The elongated tail of the beaver is used for swimming, building, and communicating with fellow beavers, and is highly distinctive. Alternatively, the otter’s body is longer, thinner in its build, and has a tail that is long but tapered. A beaver builds a dam, or a lodge, for his habitat. These are commonly found along streams, shallow rivers and other high access tributaries. These habitats can be very intricate and large to house entire families during the mating period. Otters, on the other hand, live in what is known as a holt. A holt is like a hidden hole carved out under part of the landscape. A fallen tree or a large rock can provide a good entrance for the otter, although many times he builds his entrance under water to prevent land predators from being able to enter the area. Otters tend to live by the riverside, and along banks as their preferable surroundings. This provides them access to good hunting grounds, while giving them easy entrance to their domiciles. Unlike the beaver that prefers to build across a smaller body of water, the otter can live at the edge of deep water. 1. The otter is a carnivore. 2. The beaver is an herbivore. 3. The otter belongs to the order Carnivora. 4. The beaver belongs to the order Rodentia. 5. The otter is related to the weasel. 6. 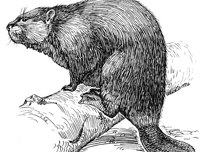 The beaver is related to the rat. 7. The otter is longer, thinner, and has a tapered tail. 8. The beaver is shorter, stockier, and has the tell tale long, flat tail. 9. Beavers live in dams. 10. Otters live in holts. 11. Beavers prefer shallower waters with two shore lines (if possible). 12. Otters live along the edge of hunting grounds. Noa A. "Difference Between Otters and Beavers." DifferenceBetween.net. May 19, 2011 < http://www.differencebetween.net/science/nature/difference-between-otters-and-beavers/ >. This really helped me and my girlfriend identify the creatures living in the bayou near our apt. Turns out it was a family of beavers. We only saw them at night and couldn’t tell if they were beaver or otter. Thanks to your article we knew they were beavers by the shape of their tail.